grandma's cookie jar: Water Balloons - 20 Fun Ideas! As I wrote about yesterday, this week is my third annual Summer Fun Days with my grandsons. One of the fun things we will do this week is to play with water balloons . . . I expect we will do this more than once! 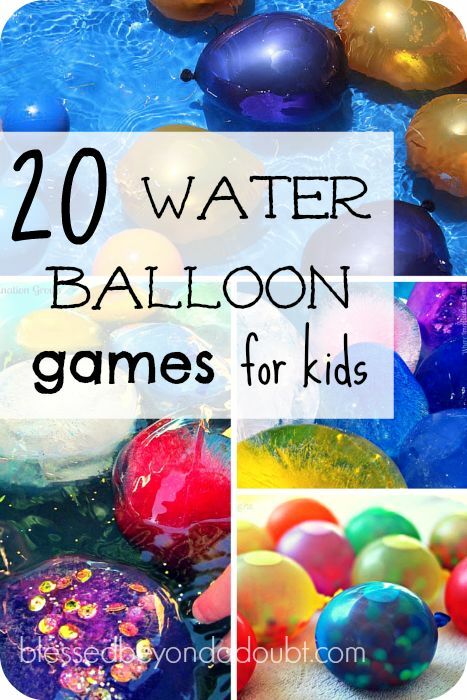 So, this morning when I was browsing on Pinterest and found a pin for 20 fun Water Balloon games, I just had to check it out and knew I also had to share it with you! I will definitely be buying more water balloons . . . and expect we will try the water balloon hunt, the water balloon pinata and I'm quite certain the boys will have great fun building a water balloon launcher! Whatever we do, I'm certain I will end up with completely soaked boys and there will be lots of laughing! I am also happy to let you know about something I found out about . . . Magic Balloons! Fill a Bunch in a Minute! Apparently with this set, I will be able to fill and tie 100 balloons in just a few minutes . . . I sure hope it lives up to it's hype - I ordered a set, it arrives Wednesday and I'm sure we will be trying it over the next few days! Have you ever tried these? If you want to give them a try - check this link out! You'll find the full list and all the details at this link. What water balloon fun sounds like something you might try with your grandchildren this summer?